Why should we change? Why don't we change? How can we change? Work out your 'Change Muscles' now so you're ready when you need them later. Learn about 'Change Evolution' and 'Behavioural Physics'. Ask yourself am I dangerous? Should you be worried that you or your team are not prepared for change? Change is inevitable and the rate of change is accelerating. You will learn why most people are unprepared for change. You will learn tools to get past those obstacles, build momentum & muscle through when it's tough. Engaging & entertaining, this distinctive session starts with my own story of doing 2 dangerous things a year, including becoming a standup comedian. It flows interactively into a series of practical takeaway tools for anyone to better handle change at work & in life. You'll realise which of the 4 stages of 'change evolution' you're at. Are you stuck in a state of 'change sloth' or 'change strain'? 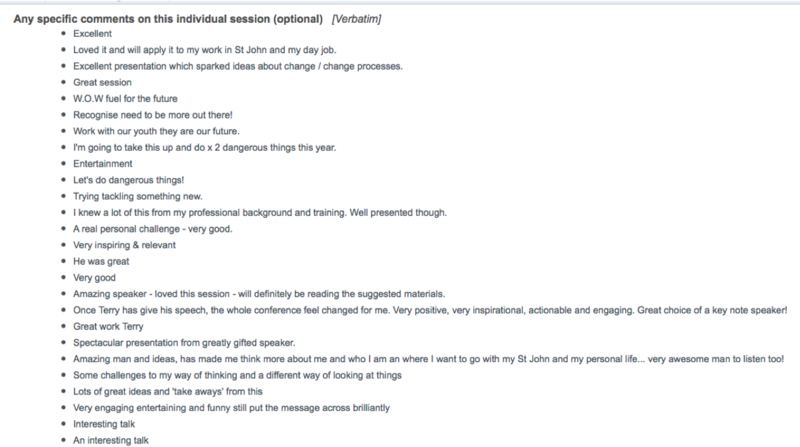 How can I help you move towards being 'change-fit'? I'm a CSP - certified speaking professional. I’ve experienced the benefits. I’ve done the study. I share these with my audiences. More specifically, I encourage you, provoke you, and tool you up to do your own ‘dangerous’ things - to test yourself now so you’re ready when life tests you later. It's funny, relevant and with well-researched practical takeaways you can implement straight away. Firstly, most people do not challenge themselves deliberately, proactively and frequently. I tell you why not. Secondly, those that do challenge themselves deliberately, proactively and frequently reap the benefits of significant personal growth and resilience across their life and I tell you what those benefits can be. Thirdly, I provide you an 8-part framework to get past those obstacles, get you started, keep you going, AND pass these ideas and encouragement onto others you care about. DIY your 'Danger DNA'. Professionals and workplace leaders attempting to prepare or improve their and their team’s resilience for inevitable stresses and changes. Why Listen To Terry's Story? I’m an expert, author & motivational speaker on engaging people. I’m a trainer and facilitator for over 25 years, and also a columnist in 'Employment Today' magazine. My books, including 'The Brain-Based Boss', take psychological research and makes it interesting and useful for people wanting to engage the people they work with or influence. I’m also a comedian, performing in several New Zealand International Comedy Festivals.